With the tag of the cleanest city in Asia, Gandhinagar is the administrative capital of the Gujarat located on the western bank of Sabarmati river. Named after the father of Nation, Mahatma Gandhi, Gandhinagar is the second planned city of India, after Chandigarh. The city is divided into thirty organised sectors, each of them is pedestrian friendly and self-contained. It's more of a people-oriented city, with all the parks, monuments, gardens and grand civic buildings. 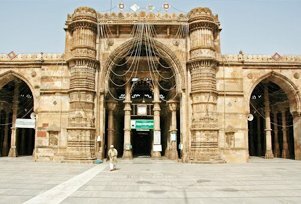 This spacious city also houses many places to visit for sightseeing like Swaminarayan Temple, Sarita Udyan, Children's Park, Indroda Dinosaur and Fossil Park, Rani Roopmatis Mosque and Capital Complex. 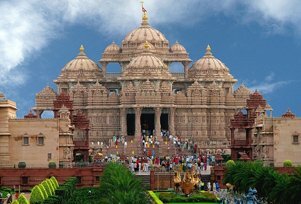 Tourists who visit Gandhinagar never miss a visit to the Akshardham Temple, built of pink stone and beautiful carving around it. For those who are a pilgrim tour to Gandhinagar can visit places like Hanumanji Temple and the Brahmani Temple. History buffs also loves Gandhinagar due to its strong connection with Mahatma Gandhi, the father of the Nation. The Gandhi Ashram in the city is known as the nerve centre where freedom fighter used to gather and plot various national movements that took place during the colonial era. All thanks to its well manicured gardens, Gandhinagar is a centre of attraction for kids as well. Kids in Gandhinagar loves to visit Indroda Dinosaur and Fossil Park, a park known for its intriguing variety of bones, eggs and fossils related to animals, mammals, reptiles and birds. One can say that people of varied age and interest can find their way in Gandhinagar. Other tourist attraction of the Gandhinagar includes Blackbuck National Park, Rani Roopmatis Mosque, Capital Complex, Sarita Udyan, deer park, GIFT City Tower, etc. Gujarati thali, flavourful fafda, and mouth-watering dhokla- one can savour the best and authentic food delights in Gandhinagar. Besides, there are many dishes that reflect the Gujarat's rich heritage. Gandhinagar is a vegetarian-friendly city. Although the capital city has many upscale restaurants, it's street food that represents the gastronomic vibe. The locals love vegetable-focused meals so much so that Gandhinagar is known to be the vegetarian-friendly city in the country. If there is any place in Gujarat that is prosperous, cosmopolitan and comfortable, then it has to be Gandhinagar. One should visit Gandhinagar to witness a unique city, which is a harmonious blend of history and culture. Pay a visit to Swaminarayan Akshardham and witness its grand architecture. Explore unique fossils, animal skeletons and world's second largest hatchery of Dinosaur eggs at Indroda Dinosaur and Fossil Park. Be a part of the awesome celebration at Uttarayan (International Kite Festival) in Gandhinagar. Dance like never before on the beats of dhol during the Navratri festival. Explore the capital complex of Gandhinagar where one can see Vithalbhai Patel Bhavan, lakes and important buildings, including the Legislative Assembly, Secretariat and High Court. Plan a day outing in the children's park, where elders can enjoy boating and kids can enjoy the mini train tour. Play golf at Aalloa Hills Resort Golf Course- It's an exciting experience. Gandhinagar is the greenest capital city in the whole Asia. Indroda Dinosaur and Fossil Park in Gandhinagar is considered to be India's Jurrasic Park. The park contains world's second largest hatchery of Dinosaur eggs.